CRR celebrated their grand opening of the new Baroness Kandy Kaye Horn Employment and Technology center with a ribbon cutting and dedication ceremony. The building is 15,000 square feet and sit side-by-side with the old building. All services in the new building will allow us to assist more veterans and their families, the Deaf and Hard of Hearing individuals, and provide employment related services to the community. 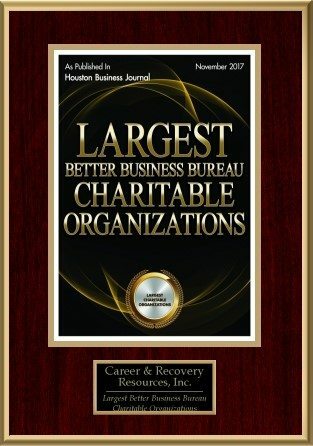 In 2014, 2015, 2016, and 2017 CRR was recognized as one of Houston’s Best and Brightest nonprofits by The Houston Marketing Firm in the compensation, benefits, and employee solutions category. Our Income Now Program which provides jobs for the homeless received a Spirit of Collaboration Award in October of 2016. CRR seeks and receives the highest level of program funding from the Veterans Administration for its Veterans Services programs. CRR became CARF certified in 2015. CARF stands for Commission on Accreditation of Rehabilitation. CARF accreditation signals a service provider’s commitment to continually improving services, encouraging feedback, and serving the community. In 2013, CRR received the American Legion Homeless Outreach Award, which recognizes CRR’s outstanding services and assistance which contributed immensely to the success of assistance to homeless Veterans. In 2014 and 2015, CRR again received this award. CRR Veteran Services was honored in July 2013 with a Certificate of Appreciation from the American Legion for its outstanding service and assistance which “contributed immeasurably to the success of assistance to Homeless Veterans in the year 2012”. Additionally in June the Homeless of Houston/Harris County HMIS Department presented CCR with their Super Star Award. Supportive Services for Veterans and their Families (SSVF) has expanded to include Brazoria, Chambers, Fort Bend, Liberty, Montgomery, and Waller Counties. CRR’s Deaf Services program expanded its emphasis on life skills such as English as a Second Language (ESL), driver’s education and other training to help deaf and hearing-impaired clients achieve greater participation in the community and workforce. Services were expanded to hearing persons as well, with American Sign Language (ASL) classes available at no charge at our main location. In 2013, CRR seeks and receives the highest level of program funding from the Veterans Administration for its Veteran Services Programs. In 2013, CRR’s CEO, Dr. Vern Swisher, was presented with the Houston Community College’s Black History Scholarship Award for unstoppable community leadership. Career and Recovery Resources launched the Veteran Reintegration Program to assist low-income veterans into the community and workforce through vocational training, employment and supportive services. The agency also launched a Summer Youth Employment Program for young people ages 16-24 from low income families to gain work experience and earn wages over the summer months. Career and Recovery Resources was among the agencies at Toyota Center on September 7-8 for the Houston Hope Fest that addressed employment, housing and family needs of Hurricane Katrina survivors. Many of these displaced workers enrolled with the agency to make preparations for their new job search and to acquire appropriate job leads. A group of CRR volunteers known as the Projects With Industry Business Advisory Council was presented with an Everyday Heroes Award by the American Red Cross. The council received the award because of its commitment in assisting people with significant disabilities to find jobs or upgrade their employment. CRR opened its new Hewlett-Packard Community Technology Center to make computer access available to the general public. The technology center is part of continuing efforts by the agency to narrow the digital divide experienced by many area residents. CEO Vern Swisher became the first recipient of the Disability Advocate of the Year Award presented by Mayor Lee P. Brown. Mr. Swisher was honored in recognition of CRR’s vision “to be the premier agency providing employment services for people with barriers” and the success of its Projects With Industry program in assisting people with disabilities to gain employment. Our Central Employment Services won the Governor’s Volunteer Award for “Most Innovative Program.” Last year, staff initiated efforts to help offenders reintegrate into society by securing through ongoing workshops held at a state jail for soon-to-be released inmates. The Hannah G. Solomon Award was presented to our Preparation for Adult Living Coordinator. The PAL program teaches life skills to at-risk foster care youth. This award is presented to outstanding individuals who have worked to bring about social change and whose impact has been recognized on the local, national, or international level. CRR inaugurated its new Jesse H. Jones Computer and Technology Center for the Hearing Impaired. This media-rich lab is unique and interactive, utilizing state-of-the-art computer and training equipment designed especially for the deaf. CRR received national recognition from the National Council on Aging as “Employer of the Year” which highlights CRR’s outstanding success in hiring and training older adults in the Senior Employment Program. CRR was among the first agencies to be awarded a contract for aftercare services and was recognized as Agency of the Year by Houston Crackdown for substance abuse treatment. CRR received honors in the category of Futurism and for exceptional service to the deaf community. The agency initiated literacy and job placement services for deaf adults two years previous and is still the only program of its type available in the Houston area. CRR initiated literacy and job placement services for deaf adults, still the only program of its type available in the Houston area. Two years later, it received honors in the category of Futurism and for exceptional service to the deaf community. The agency established Alternative House, the first federally funded halfway house in the area.